“Think only of the past as its remembrance gives you pleasure,” Elizabeth Bennet tells Fitzwilliam Darcy in one of countless exhilarating scenes in Pride and Prejudice by Jane Austen. The remembrance of Austen’s brilliant work has given its readers pleasure for 200 years and is certain to do so for centuries to come. The book is incomparable for its wit, humor, and insights into how we think and act—and how our “first impressions” (the book’s initial title) can often be remarkably off-base. 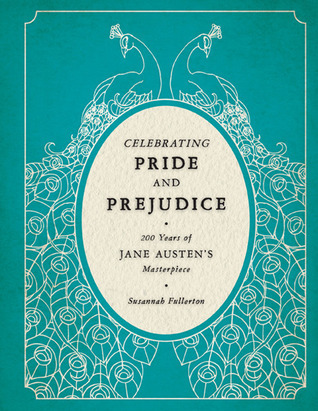 All of these facets are explored and commemorated in Celebrating Pride and Prejudice, written by preeminent Austen scholar Susannah Fullerton. Fullerton delves into what makes Pride and Prejudice such a groundbreaking masterpiece, including the story behind its creation (the first version may have been an epistolary novel written when Austen was only twenty), its reception upon publication, and its tremendous legacy, from the many films and miniseries inspired by the book (such as the 1995 BBC miniseries starring Colin Firth) to the even more numerous “sequels,” adaptations, mash-ups (zombies and vampires and the like), and pieces of merchandise, many of them very bizarre. I first spotted this book on Austenprose, and I was utterly in love with the cover. From the bold turquoise color to the stunning peacock design (reminiscent of Hugh Thompson's peacock edition of Pride and Prejudice), I knew I had to get this book! Whew! Tired yet? Although that may seem like a random detail for me to share, I think it's important for you to know just how much Fullerton covers in her book. If there is anything negative I would say about this read, it's simply that some chapters really leave you wanting more. In covering so much, the chapters don't necessarily go in-depth on the topic. For example, you could write an entire book focusing on film and theatrical versions of the novel so all you'll get in the chapter are a few paragraphs for each movie or play that talks about its strengths and weaknesses. There were times it felt more like summary than discussion or analysis, but it didn't really affect my love for this book. I wasn't reading this for the critical analysis - I just wanted something that celebrated the Pride and Prejudice's impact and reminded me of how much it has meant to the many readers who've come before me. I mention my only complaint first just to get it out of the way. Besides, it's hardly what I would call a negative. This book is an incredible tribute to the influence and reach of Pride and Prejudice. And if certain chapters leave you wanting more - well, there are numerous ways to continue researching! One of my favorite chapters was the one about reactions to Pride and Prejudice. It was so fascinating to see how the novel was received when it was first published and the journey its taken to today. For example, I learned that the novel was rather neglected during the Victorian period but was then one of the most-read novels in the trenches during WWI. It was considered therapeutic and given to soldiers during recovery. Rudyard Kipling even wrote a story called "The Janeites" about soldiers who build solidarity and even save each other because of their shared love for Jane Austen. Information like that just fascinates me. Although it's something I know in my head, I had to stop and just soak in the realization that I love something that has been read by millions before me. This story has been cherished and loved and prized for years by people of all different walks of life. And that just floored me. Even though I knew it as a fact, it hadn't really hit me until reading this book. I've underlined things that someone in a trench in Europe has known and loved. Is there a more powerful testament to the bond created through reading? I could reach back 200 years, find someone who read this book and we'd be able to sit down and talk at length (and with passion) about these characters. I mean, my goodness. There were numerous quotes throughout the book that really show how much research has gone into the book. While it's certainly Fullerton's tribute to the famous novel, you'll also get insight into what others have said about Austen, her characters, her writing style, and her impact on culture. I loved all these selections - many from other books or scholarly essays - because they show you just how many people still feel compelled to write about Austen. There are full-color images throughout, which were so lovely to look at. Everything from book illustrations to movie images are scattered about the book, which made reading that much more enjoyable. 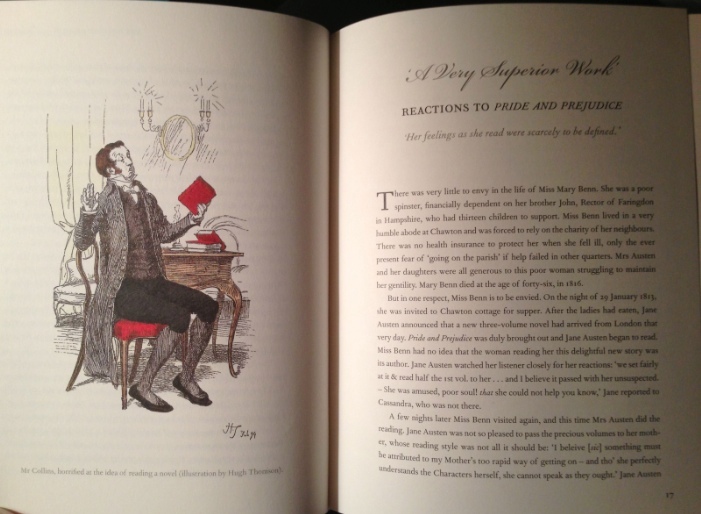 After all, you can't complain about a little Colin Firth in the Darcy chapter! It was so interesting to learn how the novel has been changed in translation, how illustrators chose to portray the characters, how publishers have packaged the book over the years, and how it has essentially spawned its own industry. I have even more I could say about this book, I've still got plenty of notes on it, but I want to let you discover the fun on your own. If you love Pride and Prejudice, I absolutely think you'll love this book. It's a joyful homage to a novel that has found a home in millions of hearts. Fullerton is clearly writing about something she knows well and loves, and it absolutely shows on these pages. What a perfect way to celebrate the 200th anniversary of the book I hold most dear! "Rereading Pride and Prejudice is as necessary as listening again to favourite music or looking once more at a much-loved painting. For really no one ever reads the same Pride and Prejudice twice. A first reading alters you; by a second reading you are a slightly different person. Every subsequent reading reveals different things about you and your world. A starry-eyed teenager will find a romantic Pride and Prejudice on first perusal, but thirty years later that same reader, now a parent to five daughter, will discover a very different Pride and Prejudice on re-opening its pages. Every reading of Pride and Prejudice is a new one." Since you mentioned it, you have to see the gorgeous peacock Pride and Prejudice iPad cover my best friend got me for Christmas from outofprintclothing.com. I can't post a direct link for some reason, but go over and check it out! It's beautiful, and I get to carry a piece of Austen with me every day! HOORAY! You simply must read it again! I need to buy this. LIKE RIGHT NOW. Also: "I've underlined things that someone in a trench in Europe has known and loved. Is there a more powerful testament to the bond created through reading?" That's the reason I read and love classic literature, because so many before me and different from me have loved it and it feels like there's some secret bond there. Ya know? ALSO. I LOVE FULL COLOR PICTURES. Color me convinced! You seriously do need to buy this! It's such a lovely book. And yes, that really is why I love classics so much! I've thought about that connection before, but I was so struck by how many people have read this, how many places it's been and how much it's "seen" in the world. So cool! Hannah! I don't whether to complain or just hug you for getting me to add both this and the annotated Austen to my TBR this week. This sounds absolutely wonderful, I'd LOVE to read the chapter about the reaction to P&P. I love that it was so popular among the soldiers, and you're right--it's so crazy but also so powerful to think about how many others have read these same words and loved them. Thank you so much for sharing this one! Glad you're interested in this! I really loved so much about it, and it was fun to see P&P through the years!